Iceland with its capital Reykjavik is located in Europe (Northern Europe, island between the Greenland Sea and the North Atlantic Ocean). It covers some 103,001 square kilometers (slightly smaller than Pennsylvania) with a population of 339,747. Icelandic, English, German, Danish, Swedish and Norwegian are some of the languages spoken by the majority in Iceland (consider regional differences). There are no land based border this country shares with any other country. Iceland is a mountainous island nation in the north Atlantic Ocean, located between Europe and North America. Despite its name, Iceland has surprisingly mild winters for a country at that latitude owing to the warming effect of the Atlantic Gulf Stream, especially when put into comparison with the Russian one. Iceland enjoys a maritime temperate climate and the winters are often compared with those of New England (though the winds in winter can be bitter). To reach someone Iceland dial +354 prior to a number. The local cellular networks are operated on 900 MHz, 1800 MHz, 3G, 4G. Websites typically end with the top level domain ".is". If you want to bring electric appliances (e.g. battery chaarger), keep in min the local 230 V - 50 Hz (plugs: C, F). The sign for the locally used currency Krona is ISK. 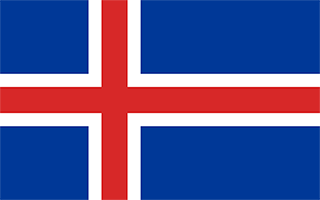 Blue with a red cross outlined in white extending to the edges of the flag; the vertical part of the cross is shifted to the hoist side in the style of the Dannebrog (Danish flag); the colors represent three of the elements that make up the island: red is for the island's volcanic fires, white recalls the snow and ice fields of the island, and blue is for the surrounding ocean. Settled by Norwegian and Celtic (Scottish and Irish) immigrants during the late 9th and 10th centuries A.D., Iceland boasts the world's oldest functioning legislative assembly, the Althingi, established in 930. Independent for over 300 years, Iceland was subsequently ruled by Norway and Denmark. Fallout from the Askja volcano of 1875 devastated the Icelandic economy and caused widespread famine. Over the next quarter century, 20% of the island's population emigrated, mostly to Canada and the US. Denmark granted limited home rule in 1874 and complete independence in 1944. The second half of the 20th century saw substantial economic growth driven primarily by the fishing industry. The economy diversified greatly after the country joined the European Economic Area in 1994, but Iceland was especially hard hit by the global financial crisis in the years following 2008. The economy is now on an upward trajectory, fueled primarily by a tourism and construction boom. Literacy, longevity, and social cohesion are first rate by world standards.